Russell Pesola (Eb cornet) is emeritus conductor of the Concordia College Band where he joined the faculty in 1975. Previously a public school band director, he has extensive experience as a guest clinician and conductor in the U.S. and internationally. He is currently music director of the Parks Rapids Area Community Band and Prairie Winds. Pesola received his bachelor’s degree in music education from St. Olaf College and has MFA and DMA degrees from the University of Minnesota. He plays trumpet with the Fargo-Moorhead Symphony and E-flat cornet with Ameriikan poijat. 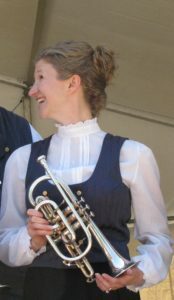 Denise Pesola (M.Mus) (cornet), is native of Northwestern Minnesota, and is Ameriikan Poijat’s “token Norwegian.” She graduated from Concordia College, and received a Master’s degree from the University of Minnesota. 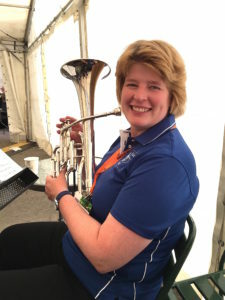 A recently retired school band director, she is primarily known in the Moorhead area as a French horn player (for instance, in the Fargo Moorhead Symphony) and pianist. 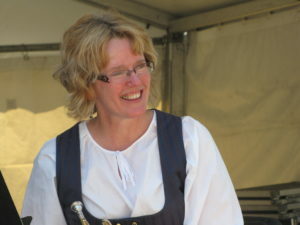 Denise has done many of the arrangements that Ameriikan Poijat plays. Brian Borovsky (alto horn) is physics professor at St. Olaf College. Before 2005 he taught at Grinnell College in Iowa. While a student at St. Olaf College in Northfield, MN, Brian was a tour soloist on euphonium with the concert band. 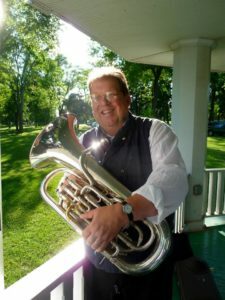 In 1997, he won second place in the North American Brass Band Association technical soloist competition, playing euphonium as a member of the Sheldon Theater Brass Band. Schooled in the art of alto horn by charter Ameriikan Poijat alto hornist Karl Hill Kortesmaki, he performs on the alto with a mouthpiece handmade for him by Karl. 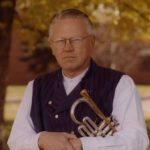 Paul Niemisto (euphonium) is founder and director of the Ameriikan Poijat (Boys of America) Finnish American Brass Ensemble. He is also founder and conductor of the Cannon Valley Regional Orchestra, a community symphony orchestra based in Northfield, Minnesota, soon to celebrate its thirtieth anniversary. He is also founder of th eVintage Band Festival. He recently retired from the Music Department at St. Olaf College, where he taught and conducted for 38 years. He is a graduate of the University of Michigan and has a doctorate from the University of Minnesota. Since 1980, Niemisto has been traveling regularly to Finland, where he has taught at the Lieksa International Brass week; Klemetti Institute Summer Youth Orchestra Course in Orivesi, Chief Conductor and Conducting Instructor at STM Summer Wind Orchestra Institute at Murikka opisto, and has given courses at many Finnish conservatories, including Kuopio, Tampere, Jyväskylä, and Joensuu. He was a Fulbright Senior Research Fellow in Finland in 1999 and 2017. In February 2000, he was awarded the Finnish Military Music Cross (soltlasmusiikkiristi) for his years of work and research in Finnish bands. 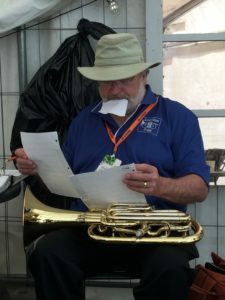 Roger Gomoll (tenor horn) is an avid pilot and travels around the United States (not always flying) as a public radio consultant. Roger has been associated with Minnesota Public Radio (MPR) for many years. As a tuba player, he is a member of the Lake Wobegon Brass Band. Roger never misses a chance to play with the Steam Calliope Band when it appears annually at New Orleans Mardi Gras. 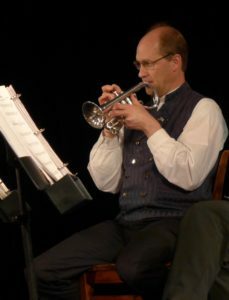 Tracey Gibbens, a third generation Finnish-American, was born on the Minnesota Iron Range in Virginia, and spent most of his youth in Duluth.He has traveled widely as a brass player and conductor, having performed with orchestras and ensembles in Mexico, Italy, as well as several sites in the U.S. He has recently returned to Minnesota from a faculty position with the University of Alaska-Fairbanks. He has played with the Duluth-Superior Symphony, Bloomington Symphony, and has been a performer/teacher at several locations in Iowa, Wisconsin, and Minnesota. He is living in Duluth, and is on the music faculty at University of Wisconsin-Superior. BECKY JYRKAS (Eb alto horn) earned her Bachelor of Arts degree with majors in music and mathematics from Concordia College, Moorhead, MN. In addition to being an active freelance musician in the Minneapolis, Minnesota area, she performs regularly on horn as principal with the Bloomington Symphony, with the wind quintet Wind-Works, and with the horn trio Trio Brava. Becky has played horn with the Minnesota Opera Orchestra and the St. Paul Chamber Orchestra and performs on the Swiss Alphorn as a member of the Rocky Mountain Alphorn Duo. She comes by her Finnish name through her husband. 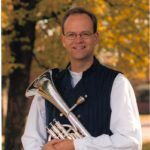 JOHN KOOPMANN, E-Flat Soprano Cornet,is a graduate of Concordia College, Moorhead, and he teaches music in the Staples-Motley School District. He is principal trumpet in the Minnesota Opera Orchestra and is in demand in the Twin Cities as a free-lance performer. A graduate of Concordia College-Moorhead, he is noted as one of the finest trumpet players in the region. ASHLEY HALL, B-Flat Cornet,is an internationally renowned trumpet soloist, chamber musician, and clinician. From small rural villages in the developing world to grand concert halls, both personally and professionally Ashley has engaged in her passion for building community and inviting people into the experience of music as a tool for connection. Recently she and her physician husband were residents of Rochester, Minnesota, during which time she was an active trumpet artist regionally, and also when she came in contact with Ameriikan Poijat. Mrs. Hall holds a bachelor’s degree in trumpet performance from the University of Cincinnati-College Conservatory of Music and an artist diploma from the Longy School of Music, Bard College. When not traveling and performing, she enjoys her second career as a mother to two incredible children, Morgan and Kevin, and as a wife/best friend to Dr Nathan Tighe, MD. 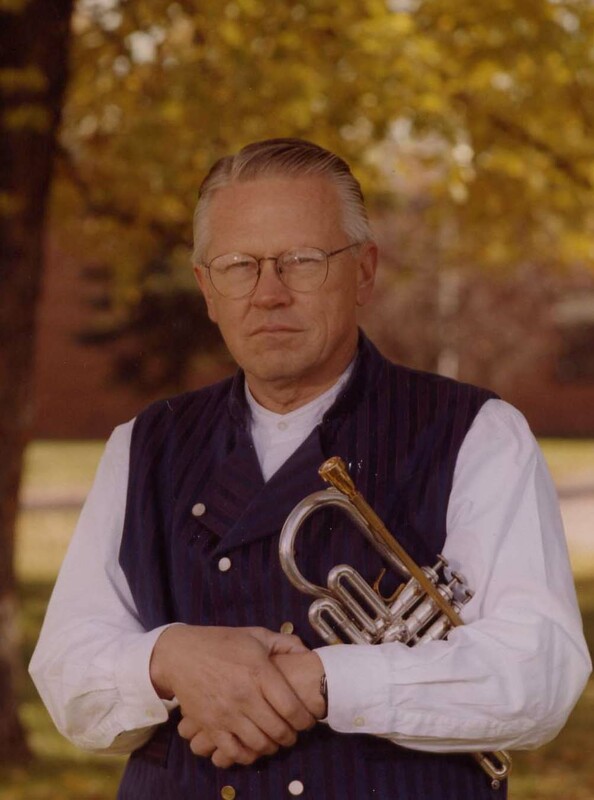 Don Hakala, a founding member of Ameriikan poijat, is an Iron Range native and third generation Finnish American, continues to be an active free lance trumpeter, and a member of the Bloomington Symphony. Marko Foss (Bb cornet) is a first generation Finnish American who spent some of his childhood in the forests and fields of Finland. He is a graduate of Concordia College and as a trumpet player performs with orchestras in Bloomington (MN) and River Falls (WI). A former band director in rural Minnesota, he now teaches band lessons around St. Paul and lives in the St. Croix Valley near Stillwater, MN. 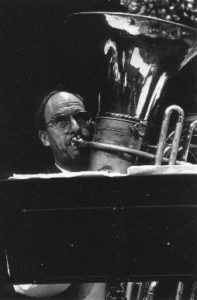 RONALD RODMAN, Alto Horn, Director of the Symphony Band, Theory, Low Brass at Carleton College, earned his Ph.D. in Music Theory from Indiana University in 1992. His research interests include analysis of music in the electronic media, post-tonal theory in the 20th century, Schenkerian analysis, musical signification, music theory pedagogy, and wind band music history. He serves as a consultant for the AP Music Theory program through the College Board. He has published articles for the Journal of Music Theory, College Music Symposium, and Indiana Theory Review, has contributed chapters to several books on music and film, and is currently writing the article on television music in the New Grove Dictionary of American Music. His recent work is a book, Tuning In: American Narrative Television Music, which is published by Oxford University Press in 2010. He is an active brass player, and has been a member of Ameriikan poijat on many concert tours, most recently to Philadelphia last December. Some Rochester music enthusiasts may have seen and heard him in the Northfield Trombones at the “Glorious Trombones” concert last Sunday. Eric Peterson, poijat “tuuba” player player for more than ten years, has a brass instrument repair business in Minneapolis, and continues to play with the Sheldon Theatre Brass Band. Eric is also known to make it to the occasional Friday morning breakfast. 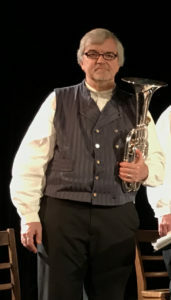 Larry Zimmerman, an active trombonist and teacher, has made several concert trips with Ameriikan poijat, playing euphonium, or tenor horn, or alto horn. Larry teaches at several Minnesota colleges. 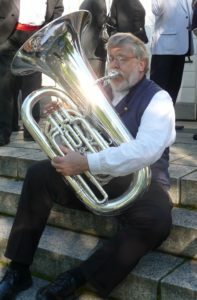 He is principal Trombone with the Duluth Superior Symphony and is a member of Chestnut Brass-Philadelphia. Too busy for breakfast. Jari Villaneuva (B flat Cornet) recently retired as solo trumpet player from the United States Air Force Band in Washington DC, and as Chief Bugler at Arlington National Cemetery. Born in Finland, he grew up in Baltimore, MD. He holds degrees from Peabody Conservatory of Music and Kent State University. Jari is considered one of the country’s foremost authority on US military bugle calls and the bugle call of Taps. He published numerous articles on the history of US bugle calls and brass bands of the Civil War and is currently working on a book on the subject. A active free lance musician, Jari is a national leader in Civil War era brass band music. He is the director of the Federal City Brass Band, a group that performs on 19th century instruments. Nathaniel Dickey (DMA) (Bb tenor horn) holds degrees from Oberlin College and Conservatory (B.A. mathematics, B.M. music performance), Rice University (M.M. musicperformance), and the University of Minnesota (D.M.A. music). On the ConcordiaCollege faculty he teaches teaching low brass and conducts bands. 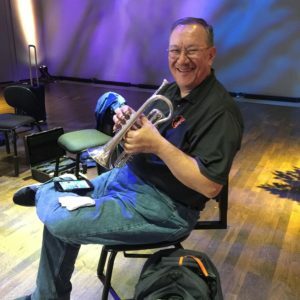 As a professional trombonist, he currently holds the positions of principal trombone with the Fargo-Moorhead Symphony, lead trombone with the Jazz Arts Group of Fargo-Moorhead, and trombone with the Post-Traumatic Funk Syndrome. 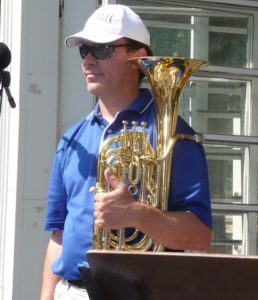 Dickey previously served as assistant director of bands at Harvard University. Nat has Finnish roots.